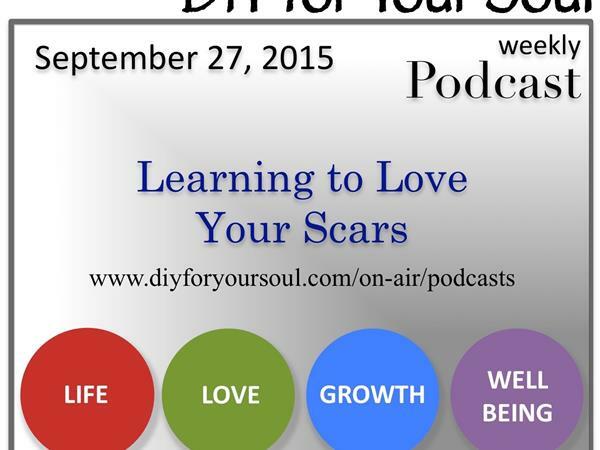 If you liked this show, you should follow DIY for Your Soul Podcast. We all have moments in our lives that we wish never happened. We’ve all been through situations that we would never want to go back and do again. And due to these difficult experiences, most of us likely have scars, physical and emotional, that we wish we didn’t have. Often times we hold on to the hurt that caused the scars; particularly when caused by other people. In this podcast, we’re looking at how the negative events we experienced in our lives, and the negative messages we took in from other, as a way to define ourselves, left scars that we not only need to accept, but that we also need to learn to embrace. And in the process of doing so, we’re likely to see what life lessons they hold for us. We can begin to ask ourselves, Who might you not have been today if it weren’t for the rough patches? And when we put them into their proper perspective, and see where they brought us, we might even actually begin to be grateful for them. We might even learn to love them.